I’m a bit late with this, but here it is at last. Last weekend saw a lot of goals scored in the first division, but in some ways perhaps the most important ones were scored in Floresta at the clash between newly-promoted All Boys and title-chasing Estudiantes de La Plata. Estudiantes’ defeat in that match has handed the impetus in the title race, for the moment, to San Lorenzo, and the victory for All Boys has given the club confidence that they could pull off an amazing survival this season. There were dramatic scenes before the match as well, when Estudiantes’ barra brava almost pulled guns on a group of All Boys fans (not the Albo barra, I feel compelled to point out). I’ll deal with that latter point first. It’s since been reported in a lot of places here in Argentina as a clash between the barras of the two clubs, but that in fact is wide of the mark. I was at the match along with Dan Colasimone of Argentina Football World, Rupert Fryer of South American Football, and Dan Edwards of Goal.com, and we were close enough to the incident that, had it happened around 30 seconds earlier than it did, we’d have been caught right in the middle of it. In essence, the coaches carrying Estudiantes fans to the game approached the stadium via the wrong route, and crossed Avenida Alvarez Jonte, down which the home fans were walking to the stadium. There was a fight, and Crónica photographed two Estudiantes barras with guns which weren’t fired, but reports that the All Boys barra were involved were wide of the mark – they were already inside the stadium, the scuffle having occurred just minutes before kick off. As for the on-pitch situation, it was a meeting between sides with vast differences in ambition. For Estudiantes, it was a chance to consolidate their lead at the top of the Torneo Apertura table, which they were joint leaders of going into the match. For All Boys, of course, the relegation table and their promedio was a more immediate concern. After a very impressive start, Albo had been confirming some journalists’ pre-season predictions (ahem) that in spite of a difficult opening fixture list they’d do better than expected, having already beaten Boca Juniors and Olimpo, and earned a point away to Colón. All the same, against the team who were crowned champions of South American little over a year ago, no-one expected too much. Especially considering that, between two legs of the Copa Sudamericana against Newell’s (a tie they’ve since lost), Estudiantes were clearly prioritising the league, and sent virtually a full-strength side out at the Estadio Islas Malvinas. For Estudiantes, youngster Carlos Auzqui was handed his third start in as many league matches up front, alongside Juan Pablo Pereyra, signed in the winter transfer window from Atlético Tucumán. It was a full-strength midfield and defence, with Juan Sebastián Verón captaining from central midfield in a 4-4-2. All Boys went for a classic 4-3-1-2, with Sebastián Grazzini as the enganche ahead of veteran Fernando Sánchez, Hugo Barrientos and Lucas Rimoldi. Up front, Sebastián Ereros dropped slightly deeper than Mauro Matos, at times turning the formation into a 4-3-2-1, but this was mostly when Estudiantes gained possession. On the ball, the hosts looked to play an expansive game, with Grazzini inevitably having a lot of influence on where the ball was spread. Realising that Seba Verón is Estudiantes’ driving force, José Romero set up his All Boys side to pressure Estudiantes in the central midfield area, where they were able to outnumber Verón and Rodrigo Braña alongside him and effectively muzzle the playmaker for much of the game, especially with Grazzini working hard when dropping back from his position further forward. Estudiantes’ main outlets thus became Enzo Pérez and Leandro Benítez on the flanks, but both had disappointing matches and with Cristian Vella and Carlos Soto pressing them high and doing a good job of not letting them pass at the full back positions, there was little Estudiantes could do. The first half was one of coming and going, and not many clear chances for either side, but when Eduardo Domínguez stabbed home from a corner to put All Boys into the lead after just under half an hour, it was a deserved advantage. Estudiantes were jolted awake somewhat by the strike, but Verón was still being well shackled and although Braña was superb at breaking down All Boys’ attacks – neither Ereros nor Matos were getting much if any of the ball – there wasn’t an awful lot of action. The half was characterised by a couple of truly bizarre officiating calls when the referee, Saúl Laverni, yet again demonstrated his capacity to give calls against the smaller side, angering the four-year-old (ish) boy directly in front of me enough that he attempted his first swear word, at great volume and a high pitch, whilst his father looked on proudly (and then glared at us when we collapsed in laughter). In the final action of the first half, Verón showed why he’s still one of the best midfielders around, though. It was the only time he escaped the shackles of his midfield markers for the whole game, but dropping deep to collect the ball out of defence, he first spread it wide before bursting forward, taking another pass in the centre of the pitch, spreading it to Auzqui in the right channel, who poked it forward for right-back Gabriel Mercado to cross. Braña deservedly got the finish to make it 1-1. It was a brilliant six-pass goal, with Verón at the very centre of the move from one end of the pitch to the other, and demonstrated to All Boys’ midfield the danger of switching off for just a moment. In the second half, they wouldn’t do. Estudiantes had some early pressure, and All Boys goalkeeper Nicolás Cambiasso (brother of Internazionale midfielder Esteban) was down for treatment for some time in the second minute after being hit in the face by one shot, but that was soon alleviated. A long ball up aimed towards Matos was poorly cleared by Marcos Rojo in the Estudiantes defence, and Grazzini pounced. Skinning Leandro Desábato, he then lifted a gorgeous vaselina over Estudiantes goalkeeper Agustín Orión. It was almost as if he’d read Dan C’s post on AFW last week and decided to give the visiting Australian another for his collection. All Boys led 2-1, four minutes into the second half, and they wouldn’t surrender that lead. They kept hold of the point thanks to a combination of hard work and uncharacteristically rash tactical decisions from Alejandro Sabella in the visiting technical area. When his side fell behind, the Estudiantes manager’s response was to move to a three-man back line, with Mercado pushed forward into the midfield, and Benítez pushed forward further on the left to make for a lopsided 3-4-1-2 of sorts. What this meant was that the defence became vulnerable to the ball being spread wide. All Boys didn’t actually target this very well – when the ball did end up on the flanks it was invariably on the right hand side (where Rojo, at left back, had some idea what he was doing to shut down a wide attacker, whereas Desábato on the other side might have struggled more) and clearly more of an accident of play than any specific plan to target the opposition’s weak areas. 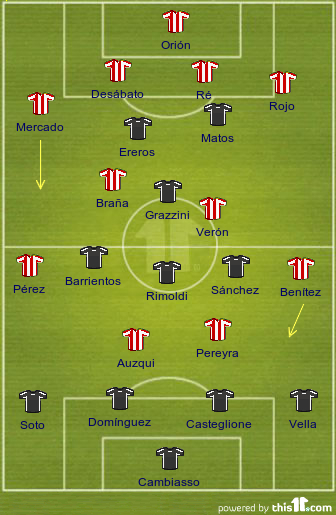 Estudiantes’ strategy on the small pitch became increasingly about getting bodies forward, best epitomised with quarter of an hour to play when Mercado – by now playing right wing but who’d started at right back – was replaced by centre forward Gastón Fernández, and the visitors effectively switched to 3-3-4 and even 3-2-5 when they were on the ball. Verón had already departed by this point though, taken off for Gabriel Peñalba thirteen minutes after All Boys’ second goal. That took much of the purpose out of the midfield, and All Boys’ defence – and their superb goalkeeper Cambiasso – were able to hold firm, ably assisted by Hugo Barrientos and the superb Lucas Rimoldi ahead of them. They also triumphed through some good substitutions. When Ereros tired, he was replaced almost like-for-like by the experienced Uruguayan Juan Pablo Rodríguez Conde (a former Estudiantes player), and later on when it became apparent that Estudiantes didn’t have many ideas, Grazzini was withdrawn to an ovation for Cristian Fabbiani, who in the ten minutes he was on the pitch was simply immense. Matías Pérez García replaced Mauro Matos to allow All Boys to finish with a similar formation to the one they’d started with, and close out the match. It was a win that will live long in the memory of fans here. The win over Boca a few weeks ago was, of course, historic in its own right, but Boca were hardly on the top of their game, whereas Estudiantes were and still are title challengers. The visitors’ subsequent exit from the Copa Sudamericana ought to focus some minds in La Plata on the title charge, but for All Boys the points are vital for survival. They’ve already got ten, from seven matches – a decent run now some of the trickier early season games are out of the way, and some slip-ups from certain other sides, and they could even be close to the top of the Apertura table themselves – and are seventh in the promedio at present. All Boys travel to Lanús on Saturday and can be hopeful that their hard work and team ethic might see them get another result, especially against opponents who’ve lost their last two matches, conceding four goals in each. Estudiantes, of course, are at home in Quilmes to Boca Juniors, resurgent in the last couple of rounds, and will be wanting to put the bad memories of the last week and a half behind them. It’s a meeting of two teams who’ve already lost unexpectedly to All Boys this season. Having seen them in action, though, I don’t there’ll be much shame in that come the end of the season; I fancy Albo to manage what I predicted of them at the start of the campaign, and stay up. Photo by me on Flickr. Join the HEGS Flickr group here.